Nassau County employs experienced trial attorneys to prosecute and litigate tickets to the fullest. Therefore, you should have, and you have the right to have, an experienced attorney representing you. Most people don’t realize the ramifications that accompany a traffic ticket conviction. · A speeding ticket conviction may result in a minimum of 3 points and a maximum of 11 points being added to your drivers’ license, depending upon how many miles over the speed limit you are convicted of driving. · Insurance carriers use these points against you and can raise your insurance premiums for 36 months if points are added to your license for any moving violation. · In the event that you receive 3 speeding ticket convictions within 18 months, or accumulate more then 10 points on your license within 18 months, the Department of Motor Vehicles will either suspend or revoke your driver’s license. · And, if you are found to have been driving excessively fast or recklessly, a Judge can even put you in jail. I am an experienced attorney who has been handling traffic and criminal matters for over a decade. In most cases, I can appear in court without your presence being necessary, thus saving you time from loss of work and other important obligations. 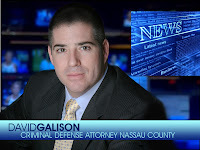 Call the office today at 516-242-4477 to schedule a free consultation and find out how I can assist you in fighting your traffic ticket. Below is a list of the Nassau County Courts that I can be retained to appear at.